Rose has always felt out of place in her family. So when an enormous white bear mysteriously shows up and asks her to come away with him, she readily agrees. The bear takes Rose to a distant castle, where each night she is confronted with a mystery. In solving that mystery, she finds love, discovers her purpose, and realizes her travels have only just begun. 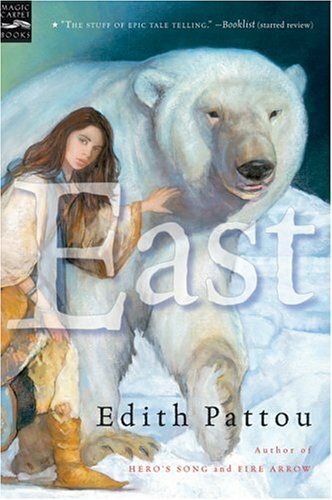 As fresh and original as only the best fantasy can be, East is a novel retelling of the classic tale "East of the Sun and West of the Moon," told in the tradition of Robin McKinley and Gail Carson Levine. EDITH PATTOU is the author of the two novels to date in the Songs of Eirren series: Hero's Song and Fire Arrow, a Booklist Top Ten Fantasy Novel of the Year, as well as Mrs. Spitzer's Garden, a picture book illustrated by Tricia Tusa. She lives in Columbus, Ohio.